wrathoranos made a good point in this thread about certificates not being shiftable, and it is quite the annoyance! Now you can shift them up and down walls, and I also made an edit for the three WA certificates of partnership with China, Egypt and France. They all have an environment score of 3 now, too (previously none). The high school diploma (GEN) and university diploma (UNI) can already be moved up and down the wall, so I didn't modify those. Naturally, the Certificate of Partnership edits require World Adventures. You can have both mods in your game at the same time, as they affect different resources. not to XMLs that govern game behavior (such as the number of days or the visa level required to obtain them). Built with game version 1.63 but should not cause problems on other patch levels. 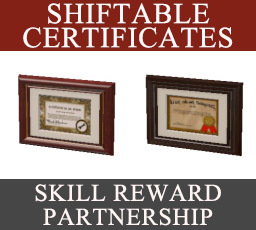 sweetdevil_ShiftableCertificateReward.zip | Description: Skill reward certificates. sweetdevil_ShiftableCertificatesOfPartnershipWA.zip | Description: Certificates of Partnership with China, Egypt, France. REQUIRES WA!